I got plenty of interesting stuff done during my week off work while visiting my parents in Massachusetts. I aimed for a medium low carbonation of 2.3 volumes of Co2. The sample I tasted at bottling was not as sour as the best examples of the style (La Folie and Rodenbach Grand Cru), but it is still clean and pleasantly tart. 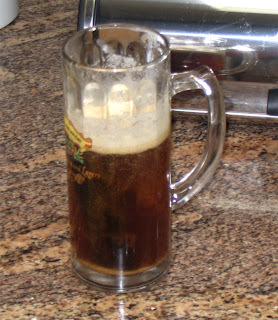 I'll have a full tasting in a couple of weeks once its carbonated. 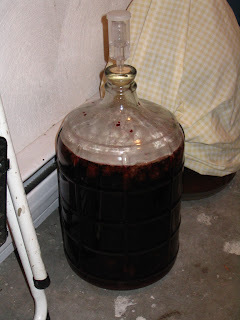 The half of the Flanders Red that I did not bottle was racked onto 4 lbs of blackberries that I bought at a local farmers market the week before. I froze the berries to break their cell walls, and then let them thaw (on the drive) before putting 2.5 gallons of beer onto them. 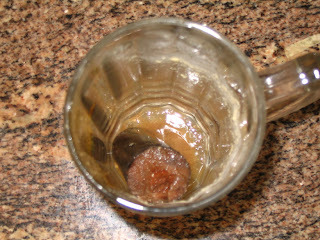 In the picture you can already see a thin pellicle forming just a few days after I added the fruit. 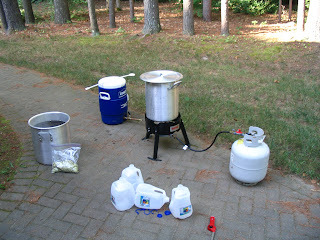 I plan on bottling this the next time I am up in Massachusetts, which probably won't be for a couple months. I am hoping the the combination of the sour fruit and additional fermentation its sugar will enable will make this half considerably more sour than the "plain" half. I also brewed a new beer to funkify. The idea was based on the original Beatification from Russian River, which was Redemption aged in used La Folie Barrels from New Belgium. The new version of Beatification is a lambic like beer that is sour mashed and then spontaneously fermented in the Russian River barrel room. Essentially I made a Belgian Pale Ale (nothing beats brewing outside on a beautiful cool summer day when you normally have to brew in your cramped-hot DC apartment). I went with a pretty simple recipe because I want to showcase the fermentation character. I bottled/transferred the Flanders Red on 8/11, but didn't want to add the wood to the Pale Ale until 8/18 so I saved the wood in a glass of the Red. I also dumped in the dregs of a bottle of Russian River Depuration (Funky Belgian Pale with Grapes). I secured a piece of tin foil over the mouth of the glass, but you can see that despite that a thick pellicle quickly formed. 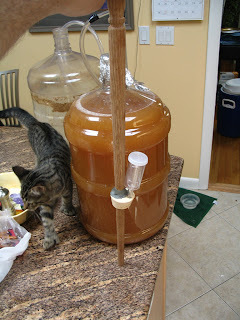 After primary fermentation wrapped up I racked the beer to secondary and topped up with about a gallon and a half of spring water. I then added the funky piece of wood (left) and topped the whole thing with a fresh piece of oak (below). So the wood you put in the glass, those are oak beans you had in the Flanders red? Sorry, that photo is pretty hard to see. It was actually a chunk of the same type of toasted oak chair leg that you can see in the last photo. You can see a picture of it while it was still in the Red if you follow the first link in this post. I also posted another photo that shows the wood right before I added it to the Belgian Pale (It isn't a great shot, so I originally didn't post it). I took it out and sawed off (using a sanitized hacksaw) everything that hadn't been in contact with the beer.